Transmission Automatic, manual and shift lever discussions. Last year I purchased a poorly done (long story, don't ask ) M52 swapped 318ti with the stock getrag 250 transmission. I've spent lots of money since last July fixing it up. But, after a while I started having issues with the transmission. I was getting locked out of gears, stalling all the time, etc. One of the main issues was I could push the clutch in, but the car would get stuck in neutral when going between gears. It was like trying to slam the shift lever into a brick wall when trying to get it in gear. It just wouldn't go. So I spent lots of $$$ overhauling and upgrading the transmission (JB Racing Flywheel, M3 Clutch, Z3 Short Shift Kit, Throw Out Bearing, Slave Cylinder, etc, etc.) The throw out bearing was shot. I pretty much did everything related to the trans except the master cylinder. The trans had no metallic in the fluid, or any signs of wear. When it was all done the car then ran like a scalded cat. Revs fast and free. Then it went into winter storage. It's been out for about 2 weeks and running fine until now. It just locked me out of gears again! The same stuff that was happening before! So I fiddle with it a bit, pump the clutch, turn the car on and off, roll down a hill a bit, and finally I get her into gear going again with no issues. Like nothing happened. The car doesn't die or anything. Just stuck in neutral. Car ran well all the way to my repair shop. This is so frustrating. I am thinking now after some research that maybe the shifter linkage is binding up because it might be the wrong one for the M52/ 250G combo. As far as I know, it is still the stock 250g shifter linkage. I have it at my indy currently, so I am going to ask them what linkage I have. 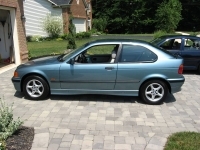 Maybe I need a shifter linkage from the 328i? I just hope there's nothing wrong internally with the trans itself. Trans has 204K miles on it. Motor is an M52B28 that was originally in an automatic donor car (which would be a Getrag 320Z manual) Maybe I need a 320Z shifter linkage for my 250G? "Don't shift for me, save the Manuals!" Last edited by Diavel; 04-15-2018 at 04:43 AM. You need the shift selector rod that was from an M50 since they came with getrag stock. I went through this with my M52+getrag swap. Tried a 328 selector rod and it was really bad, I didn't even try to drive it. Just looked back through my build thread, sorry, you'll need a selector rod for the 325is from after 9/1994. There was 9mm difference in the rods but you can see where the shorter selector rod put neutral in the pic I posted. Last edited by spidertri; 04-15-2018 at 07:54 PM. Do you feel as if the wrong selector rod would cause this issue so intermittently? It will work for weeks without doing this and then it will do it once and then take a while for it to do it again. Would I need need to buy the AKG one, or would an OEM BMW post 9/1994 work just as well? No, I don't think this would cause an issue intermittently like that. Does your shift sit noticeably in the wrong spot? Does it physically hit anything when shifting through all the gears? Does it not go into a specific gear or all gears? Once you get it into gear does the problem happen each time you shift after that? You certainly don't have to buy the AKG rod, an OEM will work no problem. It just has to be the 325is post 9/94, it's a different selector rod than the 328is version. It seems slightly off as it stands, but not to the extent of the picture you posted. 1st gear sits far forward, but still in the middle of the shifter. Sometimes its a bit finicky (like it's physically hitting something) going from 2nd to 3rd. I definitely do think it has the wrong selector rod, but if that's what's causing the problem is a different question. I don't know what else it could be. I think a new master cylinder and selector rod are the only suspects left. Once I get those sorted, and it happens again, I think it would be safe to say my trans is bad. EDIT: What shift carrier would I use? Last edited by Diavel; 04-30-2018 at 05:00 PM. I used the 325is shift carrier, p/n 25111221541. Got it from a part out. The other thing I swapped was the stock ti slave cylinder to a M3 slave cylinder since my clutch kit/ltw flywheel was M3 size. I haven't been able to get a hold of my mechanic to talk to him or see if he got the problem to replicate yet. So I have no updates on my end. I do know that the previous owner (the person who did the swap) cut a ton of corners though, and judging by the decisions he made (that I had to have fixed) I doubt he used the proper shift carrier or selector rod. For example, he cut a major corner and kept the M42 motor mounts for the 6 cylinder! Not to mention they were worn so badly they were an inch shorter than new! Last edited by Diavel; 04-17-2018 at 12:02 AM. 200+ miles on the new master cylinder, Garagistic DSSR, and shift carrier from a 9/94+ 325is and the problem hasn't (knock on wood) come back yet. My indy also adjusted the Big Boy clutch stop, so the clutch pedal isn't so on/off, just in case the clutch wasn't engaging 100%. Shifts definitely require a bit of extra punch with the Z3 SSK and DSSR, but it feels so crisp and mechanical now it's awesome. Thanks for the tips, spidertri! Last edited by Diavel; 04-30-2018 at 04:59 PM. Glad to hear it! Always happy to help.